A feral cat is one who has either never had contact with people or he’s forgotten his time with them. Ferals live on city streets, in alleys and parks. They could be wherever there is a supply of food, water and shelter. They are free-roaming cats who’ve reverted to wild ways for survival. No one knows how many ferals there are in the United States but the population is estimated to be in the tens of millions. Ferals are domestic cats, just like your house cat, but they’ve lost any feeling for humans except wariness. They take care of themselves in a world that is often hostile and dangerous for them. If a feral makes it past kittenhood but lives on his own, his life expectancy is approximately two years. If he is in a colony with a regular caretaker, he might live to be 10 years old. The term feral is sometimes used to include cats who are abandoned or lost from their homes. Technically, these cats are not feral, they are strays who once lived with humans. They remember being with people and are less afraid of contact with humans. Ferals stay away from humans as much as possible. 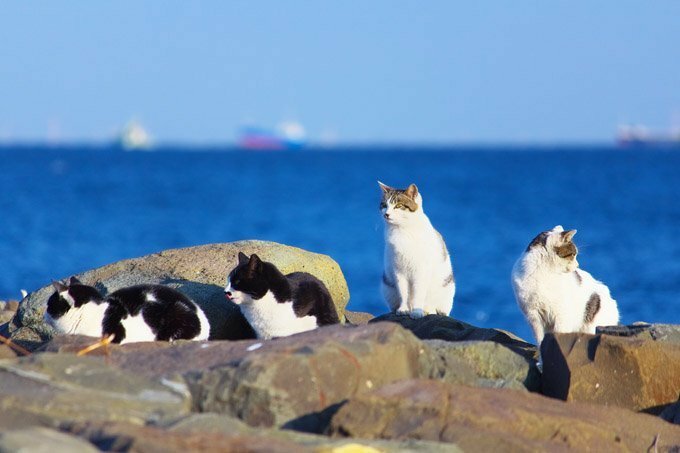 They often join other feral cats in a colony since there is protection in numbers. Feral colonies are established in areas that provide food, water, and safety. A colony is lucky if it has a human caretaker who brings food and water every day. Feral colony caretakers are usually cat-loving, concerned humans who want to help ferals survive.They provide nourishment for the colony and often keep track of the members’ health. Many communities consider ferals a nuisance and try various means of eliminating them. Where archaic, inhumane methods, such as shooting, poisoning or gassing, have been used, they have been dismal failures. If you eliminate feral cats, they come back in larger numbers to fill the vacuum. Other feral cats move into the area and the birth rate goes up. The best way to control the feral cat population humanely is for a caretaker or rescue group to use the Trap-Neuter-Return (TNR) technique with the colony. TNR involves trapping colony members, transporting them to the vet for spaying or neutering, and returning them safetly to the colony. While at the veterinary clinic, they are also vaccinated for rabies. This is a good way to stabilize the colony, reduce fighting, and eventually bring down the size of the colony through attrition. Communities, caretakers and rescue groups must work together. Feral kittens can be socialized and go on to make good cat companions if they are taken out of the colony early enough.However, socializing a feral kitten requires a bit of extra effort. The trick is getting the kitten to associate you with food, thereby creating an incentive for him to approach you. Additionally, the kitten will need to see and interact with a lot of different people.